“Good taste is forever.” It may be the Brunschwig & Fils motto, but it was Truex who came up with it and it applies equally well to the man. I’d read about Van Day Truex before. On the internet, of course. My education in the design world is sadly lacking. I bought the book and it sat, undisturbed, on the bookshelf for more than a year. But then Square With Flair™ mentioned it again and a brief discussion in the comments section last week led me to take the biography down from the shelf and settle in whilst nursing a cold. There is much to learn here. Van Day Truex had a remarkable gift for design and a highly refined “design judgement.” He also had the gift of elegance. All as a result of a trained and critical eye. Truex is frequently described as elegant and his creations also earn the distinction. But what made him elegant? The author isn’t as interested in exploring that facet of Mr. Truex’s life, but it does bare some examination, if only because Van Day Truex took pains to present an elegant figure to the world. Like Cary Grant, he was self-invented. He was tall, whippet-thin and an early viewing of “Lady be Good” with Fred Astaire left him with a desire to wear bespoke clothing and move through life with a little more style. Time and practice would bring him that. But it was when he was taken into what would become the Parsons School of Design, under the tutelage of Frank Odom that he came into his own. Mr. Odom taught him of the importance of the classical in design and to cultivate society. I had meant for this post to be a distillation of what I thought were the contributing factors to “Mr. Taste” ‘s seemingly innate elegance. Instead, I find that it eludes me, too. I can only speculate that he made up his mind to be more refined in all things, and took from his surroundings those things that fit into his world view. “Train their eye, instill in them an idea of quality and develop their sense of style.” That was the mandate at Parsons and may do much to explain Truex’s elegance. Van Day Truex: The Man Who Defined Twentieth-Century Taste and Style by Adam Lewis. Highly recommended. This entry was posted in Elegantology and tagged Burnet Pavitt and John Mallet, Cary Grant, Elizabeth Chachavadze, Frank Odom, Parsons School of Design, Princess Edmond de Polignac, Smithsonian Institution, Tiffany & Co., Van Day Truex. Bookmark the permalink. It’s an appealing notion that you can “grow up” even as an adult. It’s an inspiring story in a lot of ways, but there seemed to be a thread of sadness in the periphery. Another in a long list of fellows whose taste was not based on bank account. Such a great book. I should go back and re-read it, especially in light of the research I’ve done on Billy Baldwin. PS… thanks for the mention. The notion of bearing, attitude, Manners, and yes, genes do help, has everything to do with elegance and when I read accounts of others gong so far as to support these paragons of style and refinement in order that they might continue to “live that way,” I see it as our own need to be graced with the presence of their creation. Are they any less a work of art? We all know Cary Grant was mystified with everyone’s preoccupation with ‘being Cary Grant’ and longed himself to be this exemplar of the debonair man. I remember reading somewhere that following his acting career and stint on the board of Faberge, when he was on the speaking circuit in the remaining years of his life, he was dumbfounded to discover that crowds would actually turn out to see this faltering mass of decrepitude. (I feel certain he said that far more elegantly than I). Yet, while his appearance had altered, his essence was intact … and my verbosity knows no bounds, so I shall quietly leave the room. eA, Good thought… since CG hadn’t yet existed, it was necessary to invent him. Mrs. B., of loneliness more than anything else. At least that’s how I read it. Searching for perfection in everything is bound to leave one disappointed. There must be the philosopher’s knot. P-D, thanks for bringing him to my attention! I think that Van Day Truex doesn’t have the fame of other arbiters of taste because his aesthetic in everything was so classic, restrained, and pure. He liked classic suits of the finest quality, and the same for furniture be it Bauhaus or Louis XVI. His early training was in Europe, and there is no replacement for this exposure to centuries of art, skill, balance and proportion, that is visible on the streets of European cities. Unlike so many designers, he did not feel obliged to re-invent the wheel. He understood classic design, balance and proportion. I’m sure that he would consider some of the “innovative” designs of 21st century architects, decorators, and fashion designers as clownish and clumsy. I’m sure there wouldn’t be any Issey Miyake in the wardrobe of Van Day Truex! I wish that more books about him were available. 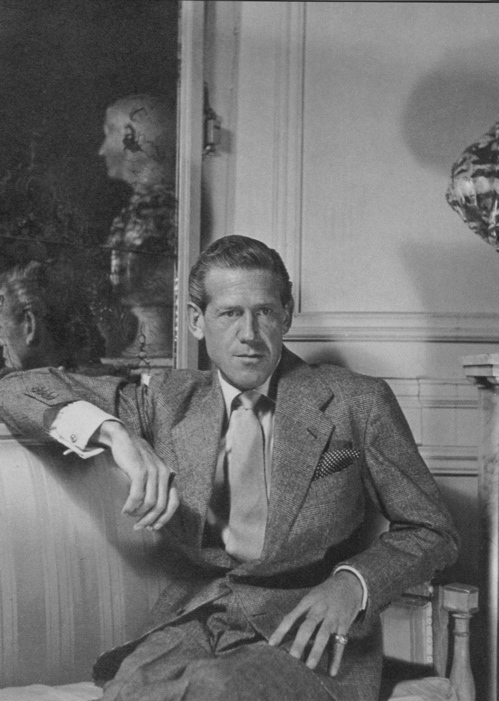 During his period as design directory at Tiffany’s he got rid of any designs that did not meet his rarefied aesthetics, in the process bringing prestige and taste to the reputation of the store that continues to illuminate their name throughout the world. Old Tiffany catalogs from the 1960s are a great place to view his designs, selections, and influence. Like Cary Grant, he appreciated the satisfying effects of sobriety, simplicity, quality, and what is appropriate to function and occasion. In this day and age, more than ever, we need more people to follow his example. When I lived in New York, my telephone number was one number different from that of Mrs Sheldon Whitehouse (Sr.) and many times, I received the most impressive wrong numbers. One early morning, much too early for me, my phone rang and a very distinguished voice said, “This is Van Day Truex” and asked to speak with Mrs. Whitehouse! Trying to sound decently awake, I could only say, “I’m sorry but you have the wrong number” and I gave him the correct one. I’d have loved to have had a real conversation with him but it went no farther than that. I love the illusion of Cary Grant, I am afraid I cannot stand the phoney that he was, his look and manner on screen were perfection, I’m afraid the man in ‘real’ life was a weak and troubled soul. Hello Ms. S-C, thank you for reading and for your comment. I’ve read everything ever published about Cary Grant (including accounts by his butler and daughter). Whilst he did fight personal demons (insecurity, most notably, and the difficulties with his father and his institutionalised), he was by almost every account a decent, highly professional actor, fun-loving, generous friend and good father. His failed marriages may attest to a weakness of character, but I’m sure that the 50% of the population which is divorced may disagree with you. But thank you for your opinion, for taking the time to sound off and for listening to my two cents. I chose Cary Grant as the site’s “mascot” because he made himself over into the suave image of him that we know today. I have hopes that it is possible for anyone to fashion himself into whatever self-image he would choose. Truex seems to have been born elegant and with exceptional taste!